How to Remove Any Android FRP Lock? 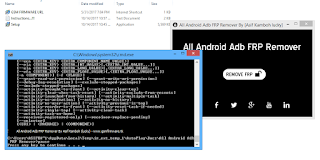 Extract the "All Android ADB FRP Remover by [Asif Kamboh Lucky]" Tool Compressed File Using WinRAR. Run and Install "Setup" File. After That Right Click on "FRP REMOVER" Icon on Desktop and Run as Administrator. Now Connect Your Mobile Phone in ADB Mode with You PC or Laptop Via Original USB Data Cable. Click on "REMOVE FRP" Button, Factory Reset Protection Lock 100% Remove Done.enjoy! Thanks GSM FIRMWARE TEAM "MUKESH SHARMA"
Thank You "marco populo" For Rating This Program. 5* + 10.000 likes good job bro. Thank You For Your Love...! It's my pleasure, Thank You. Use WinRAR to Extract the compressed file..."?" Welcome...!!! & Thank u for leaving your comment "Mr. Imran Tech"
If you are using windows 10 or 8.1 OS, Turn off defender and other virus protection programs, and this program works very well...!!! 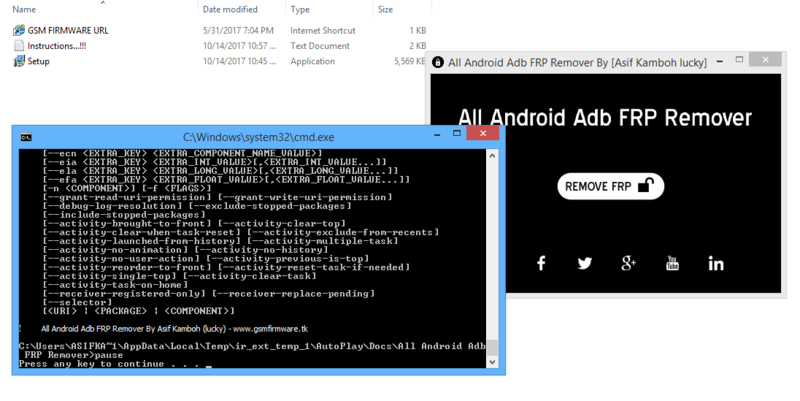 "Mr. Jack MD"
THIS FRP REMOVE TOOL WORKED MODELS OF SAMSUNG GALAXY S7 AND S7 EDGE AND G930F, G930FD, G930TX, G930RX, G930V, G935F, G935FD RUNNING ON ANDROID 7.0.1 . SO 1ST SELECT THE YOUR MOBILE MODEL AND CLICK ON ENABLE ADB AND THEN CLICK ON REMOVE FRP. Does this tool support the samsung s8/s9/note 8? If so then do we just flash the eng root file by using odin for those models or what's the way to put it into ADB mode for above models? If so, then how would you put the above models in ADB mode? please help me with mine, is a SM-P585M and I can't access the debbuger to active, it will work without that?